“Do you know that there are Naara pattu sarees and dhotis made of plant fibres, as described in our Puranas and Ramayana in coastal Andhra Pradesh?” Flummoxed by this question of my aunt Smt. Gotety Hymavati, I asked her for more details, and am introduced to a little known world of esoteric little and micro traditions of textiles based on bast fibres (fibres of the inner bark which surrounds the woody stem of numerous plants). The very name and meaning of these traditions is intriguing. Naara pattu means a fibre that is like silk- naara means plant fibre, while pattu means silk. I plunged into historical documents and textile history sources to know more about this intriguing and fascinating textile tradition. There was little information that was available and it became apparent that these diverse bast fibre clothing traditions had been overlooked. But these were living traditions and bast fibre clothing was used by people at least until mid 20th century CE. Hence, oral history became a very important and the only source that could give any information about bast fibre micro textile traditions. Where were these produced, who consumed them in what contexts, what was their place in the clothing traditions, were questions that were explored in my study (which is ongoing).There was documentation of the utility products made from bast fibres from British colonial times. This focused research was due to the dire need of the British for package materials-ropes, yardage- for goods that were transported on ships to Britain. However, there was a vibrant tradition of bast fibre clothing across India which was not documented. This article maps the bast fibre micro textile traditions that were spread across the country once upon a time in 20th century CE. Macro textile traditions such as sarees, dhotis of various regions are acknowledged and mapped. But, micro textile traditions with niche production and consumption which is necessarily limited, have largely been overlooked and not documented. Bast fibre micro textile traditions that were mentioned in ancient times (see Moti Chandra) are absent in modern textile history. My research attempts to map them in 20th and 21st centuries CE. As oral history is the main source to remap Bast fibre micro textile traditions, by way of this research paper, it is hoped that more oral histories are reported by the readers. Deeply embedded in diverse social and cultural contexts these micro traditions were visual markers of gender, individual status and position, occasion and community. And for the longest time they served and still continue to serve a niche clientele that was local as well as spread across India. Each region had its micro traditions which capitalized on the local bast fibre plants for various needs whether for textiles or utility items. According to Moti Chandra (1944)[iii], in the Gupta period, of the four classes of textiles in the Gupta period, was ‘Valka’ that is made from back fibres which were listed in ‘Amarakosa’. Sadly, these once rich and vibrant plant fibre textiles traditions of varied communities in India have been largely lost to us, on the one hand because they have been abandoned by the communities due to lifestyle changes and on the other because they have been marginalised by the easy availability of cotton and silk fabrics. Of all the textile traditions, the bast fibre textile tradition is the least documented. There is scant information on the number of the traditions that existed or are still extant or about their present condition. Today, they remain for the most part in the memory of people who have used, seen or heard about them. What used to be living and vibrant traditions across India, even in mid 20th century CE (and within the lifespan of a 70 year old person), involving knowledge, technology and skills that were in the hands of the people, are now either extinct, dying or fading away. But the existing traditions though fading give us a fascinating insight into the embedded folk knowledge and skill support systems in these traditions. These region specific bast fibres were harvested and processed according to the local knowledge systems, technologies and skill sets such as retting, or through a simple but effective machine which pressed the pulp out, and prepare the fibres for weaving. Across the Himalayas, different kinds of nettle has been used by various communities such as Sherdukpen, Monpas, Lepchas and Gurungs(including Nepal) etc. for making cloth. Traditionally, the Himalayan giant nettle known as Sisnu was used by the Lepchas of Dzongu in Sikkim for clothing and other purposes. The Sherdukpens of Arunachal Pradesh used one kind of stinging nettle, while the Monpas(and also by their counterparts in Bhutan) used the Himalayan giant nettle. In Central India the Bonda’s Ringa is made of Kerang fibre (extracted from multiple plants including Calotropis gigantea) which is still worn, but whose production process is yet to be thoroughly documented. In South India naara pattu typically made of Agave fibre was selectively used by- women who were widowed and, brahmins for doing puja. Seventy five year old Smt. 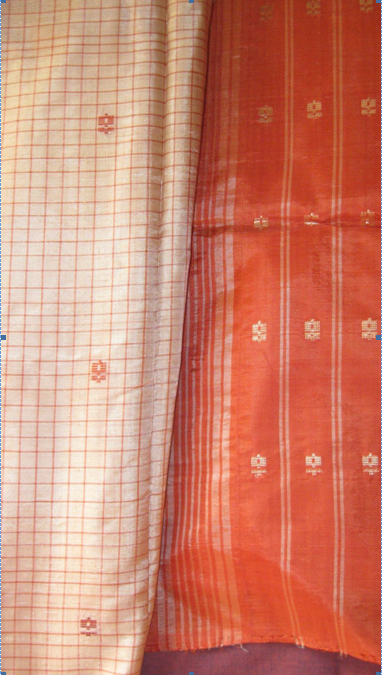 Gotety Hymavati (personal communication, 2014), recalled that it was common to have Naara pattu cloths – panchalu (dhotis), kanduwalu (shoulder cloths), and cheeralu (sarees) in brahmin households in her village Pittala Vemavaram near Tanuku in West Godavari district, Andhra Pradesh. Sold as ‘Berhampur pattu‘ by itinerant traders carrying their merchandise on shoulders, these were popular amongst the brahmin households. Men and widowed elderly women wore them for madi (ritual purity) for puja as they retained their madi state for a long time and did not need to be washed after every use. They were popular when people went on pilgrimages as they could be used multiple times which saved them the bother of washing them after every visit to a temple. The design repertoire was limited and nearly uniform for all cloths-a natural brown, ecru, murky coloured fabric occasionally having a border of red or dark brown. The sarees came with a very short border called as ‘lakka anchu‘ (lakka means lac, and anchu means border width) of approximately one inch (which was the width of a lac bangle sold in the region) and couple of vertical lines that denoted the pallu. They were soft, silky, lasted for a long time and dried quickly which made them ideal for madi as well as for pilgrimages. Further down the coast, in Tamil Nadu clothes known as naar pattu/naarmadi were similary used. Their usage is echoed by 90 year old Smt. Lakshmi Subramanyam, who recalled (2014), that these sarees and dhotis came from Calcutta and were made from the fibre of the ‘Railway Katrazhai‘, (Agave/Aloe) grown along railway tracks. In Karnataka these were known as ‘Kalnar’ that is, the fibre of the Agave plant. In urban areas, these were available in special shops which sold traditional clothing items, and puja items. The most widespread of these fibre cloth traditions is the banana bast fibre production. Banana has for long been harvested for its fibre and the cloth was known as ‘Banana silk’ or in the vernacular language as ‘Kela’ silk and ‘Vazhai pattu’. Banana silk was the ‘poor cousin’ of the real (that is insect- silk moth) silk, and was popular in South as well as North India. Chinnalampattu silk sarees of Tamil Nadu, were widely worn by the common people for its lustrous silk finish, a vibrant design vocabulary, softness, durability, strength and affordability. Its colour palette and design vocabulary was imitative of the Kanchipuram silk sari. Smt. Lakshmi Subramanyam recalled that she wore them for a long time as the sari was very comfortable because the banana fabric kept the body cool in the hot climate of Madras. 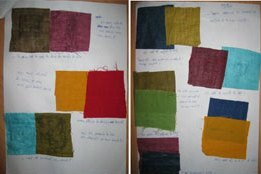 Kela silk was available in North India too in places such as Kanpur (late 1940s) (personal communication Smt. Promila Chaturvedi 2014) and Delhi in 1970s (personal communication Prof. Archana Shastri 2014). Whether Berhampur pattu, Naarapattu or Kalnar, these once ubiquitous clothes are a rarity today. Brahmins who constituted a large consumer base stopped using them, and moved onto silk which became affordable as well as widely available. With the advent of social reforms, widows stopped wearing these sarees and another widespread but significant consumer base was lost. The traditional modes of production of banana fibre have also been lost today. 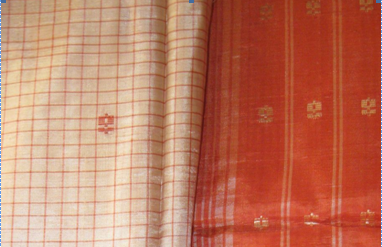 According to Shri Chellappan, General Manager Production of Co-optex (interviewed in 2014), the Chinnalampattu sarees are made through the technical process of man-made rayon. Fig. 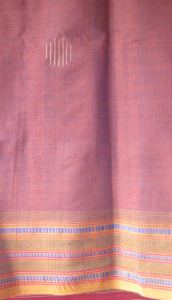 1 is a Chinnalampattu saree bought from Cooptex in 2014, which has a texture of silk, is shiny and has a contemporary design template of South Indian sarees, and a newer colour palette. The women of the Bondo tribe of Malkangiri in Odisha continue to use their Ringa made of Kerang fibre, but some ‘civilised and mainstreamed’ members have switched to modern synthetic fibres and clothes. Further up, in North East India, the same story is repeated. In Assam, sarees woven with Ramie fibre, were worn for ritual use in 1920s (personal communication Prof. Lotika Varadarajan 2014). Today, it appears that this micro textile tradition has been erased from memory. The traditional nettle fibre cloth production which was a household activity for communities across Himalayas is on the wane. North east India’s bast fibre textiles traditions have long been marginalised and supplanted by imported cotton and synthetic acrylic ‘Arunachali dhaaga’ which came through trade. The extensive plant fibre textiles traditions of varied tribes in North East India have largely been abandoned by the communities due to lifestyle changes as well as the availability of synthetic fibres. Along with these clothing styles the technology and knowledge embedded in these micro-textiles traditions has also been lost. The re-discovery and branding of these Aadi fibres as future fibres has meant re-inventing the wheel, research and development, and new technology to extract fibres and process, all of which necessitates significant investment of money. Today, there is considerable R&D conducted on these Aadi – alternative and futures fibres in India. Lotus stems, banana trunk, kenaf (Gongura), ramie, bamboo, hemp, nettle, jute, etc., are being explored for their textile potential as they are abundantly available in the country. Bamboo fibre and bamboo rayon products though expensive, have found a supportive niche market in urban areas across the country. Fashion designers and boutiques are increasingly using them to make expensive clothes for a urban niche consumer base. Anakaputhur is well known for its experiments in alternate fibres and its products are well received across the country. Fig 2, is a saree made with a contemporary design template and colour repertoire of Anakaputhur (sample bought in 2014). 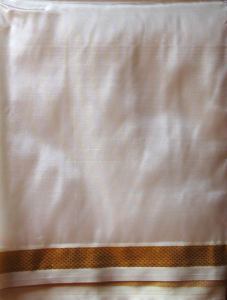 The texture of this saree is smooth like cotton and it does not have a silk finish. Co-optex continues to produce and sell Banana rayon Chinnalampattu sarees and traditional Kasi pattu naarmadi made of Kela silk is widely available in puja shops (shops selling puja items) in cities as well on internet sites. Fig. 3 is a dhoti which is named as Kasi pattu naarmadi bought from a popular puja shop. 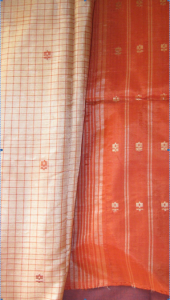 The dhoti has the finish of silk and has a typical design template and colour palette of a silk dhoti. The name Kasi pattu naarmadi is intriguing, which underscores the sanctity of cloth doubly-that it is inherently pure due to its materiality (a sanctified bast fibre), and the association with Kasi or Benaras the ancient holy city. Reportedly the raw material came from Kasi (interview Giri Stores Chennai, 2014), hence the name of the dhoti. Since the last few years, Dastkari Haat Samiti has been selling Hemp stoles from Himalayas. These Aadi fibres are the present day futures fibres. The challenge they face is the contemporisation of their use for today’s requirements, whether in terms of extensive fabric softening, or developing design repertoire, as well as the de-embedding within the traditional socio-cultural contexts. Can our Aadi fibres overcome these challenges and reclaim their rightful place as futures fibres? [i] Gopal Lallanji. 1961. Textiles in Ancient India. In Journal of the Economic and Social History of the Orient. Vol. 4, No. 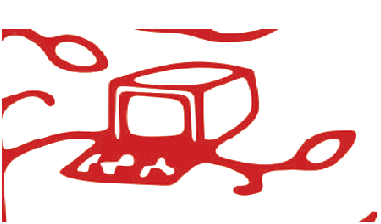 1 (Feb., 1961), pp. 53-69, Brill. [ii] Alkazi Roshen. 1983. Ancient Indian Costume . Art Heritage Books. New Delhi. [iii] Chandra Moti. 1944. The History of Indian Costume From The 3rd Century A.D. To The End Of The 7th Century A.D. , in Journal of the Indian Society of Oriental Art. Vol. 12, 1944.